Bob Adelman’s amazing photographs—the majority of them black-and-white prints—fill the second floor of the Museum of Art in Fort Lauderdale, where they will be on display until May 17. He photographed what came to be significant moments in the civil rights movement as they were happening. 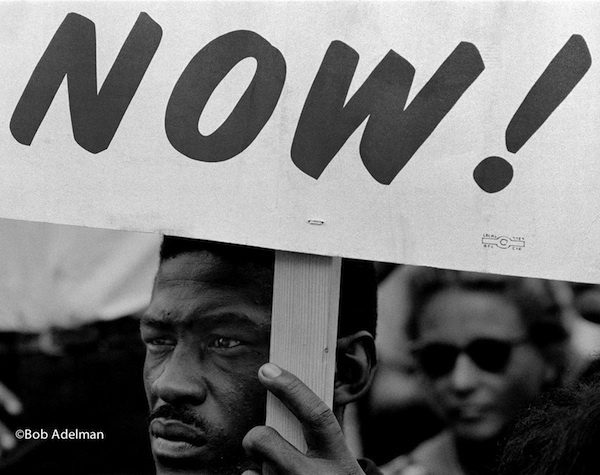 As a photographer for CORE, SNCC, Life magazine, and the NAACP Legal Defense Fund, he was on the scene for moments both momentous and not, to photograph Malcolm X and Martin Luther King Jr. and also never-to-be-famous individuals, families, children—people we wouldn’t have seen again, had Adelman not been there to show them on the sidelines as well as in the forefront, their eyes their own camera lenses, looking back; exiting “White Men Only” bathrooms at the courthouse in Clinton, Louisiana; and then kids who climbed up in a tree to view the memorial service of Dr. King, attended by Robert Kennedy (what a portrait of grief), who’d be dead himself only months later. As a documentary photographer, nothing stopped Bob. It was dangerous work, as was pointed out by one of the speakers at the January 19 museum opening, but Bob found inequality inexplicable and insupportable. In his college years, he studied philosophy to try to figure out the point of being alive. In the civil rights movement, he found his answer. Ann Beattie’s story “Janus” was included in John Updike’s The Best American Short Stories of the Century.